Hainan Island is located in the south China Sea, about 1 hour by flight from Guangzhou, the biggest city in the southern part of China. Except flight, there are several trains connecting Hainan Island with Mainland China. Travel to Hainan Island is a good choice for travelers with enough time and want to see more on the way, also to experience China’s first cross-straits passenger rail link from Hainan Guangdong Province to Haikou Hainan Island. There are trains running from Mainland China Cities including Beijing, Shanghai, Guangzhou to Haikou, and Beijing to Sanya. Takes 39 hours, the cheapest seat is CNY435, a hard sleeper costs CNY842, and soft sleeper at CNY1330/person, booking fee is 15%. To book the train tickets, please email us your name and passport no, and travel day, then we will make the booking for you and email you the confirmation code with which and your passport you get your ticket at Beijing West Station on the departure day. 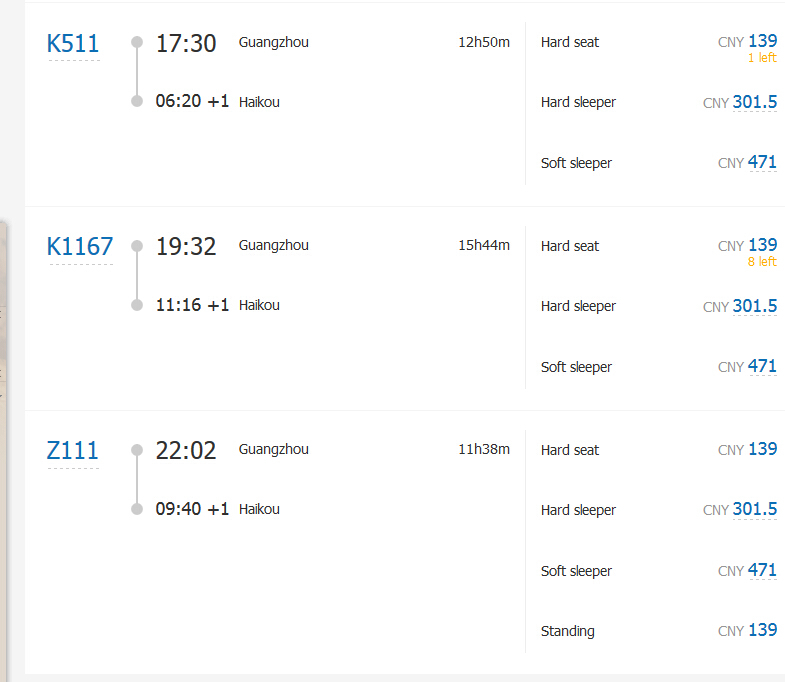 There are several trains running Canton/Guangzhou Haikou, from 11 hours to 15 hours, hard seat costs CNY139/person, a hard sleeper at CNY301.5/person, soft sleeper costs CNY471/person. Our booking fee is 15%. To book the train tickets, please email us your name and passport no, and travel day, then we will make the booking for you and email you the confirmation code with which and your passport you get your ticket at Guangzhou Station (广州站）on the departure day. Only one train daily from Shanghai Train Station to Haikou, takes 35 hours, hard seat costs CNY325.5, hard sleeper costs CNY649.5, and soft sleeper costs CNY1096.5. Booking fee is 15%. To book the train tickets, please email us your name and passport no, and travel day, then we will make the booking for you and email you the confirmation code with which and your passport you get your ticket at Shanghai Station on the departure day. Then from Haikou to Sanya, you will take a high-speed train in 2 hours. Please note that your train arrives at Haikou Station, the city center station is Haikou East Station.